Prime Minister Narendra Modi on Wednesday announced that India has become the fourth Elite Space Power after DRDO scientists successfully carried out Mission Shakti today. The Prime Minister announced that India's Anti-Satellite (A-SAT) Missile shot down a Low Earth Orbit (LEO) Satellite in Space. "I assure the international community that our capability won't be used against anyone, but is purely India's defence initiative for its security. We're against arms raised in space. This test won't breach any international law or treaties," PM Modi added. India Becomes Elite Space Power With Successful 'Mission Shakti' Test, Indian A-SAT Missile Shoots Down Low Earth Orbit Live Satellite in Space. Not many know that there have been talks in India on bringing together such a missile for years and similar such test missions have been carried out earlier to display India's capability to intercept enemy missile with the help of anti-ballistic missile systems. What is Low Earth Orbit and Anti-Satellite Weapon? Know About India's 'Mission Shakti' and List of Super Elite Space Power Countries. Has India been equipped with an ASAT system for years? As per reports from the year 2010, the then DG of DRDO Dr VK Saraswat, who was also scientific advisor to then defence minister AK Antony had said that India had all the building blocks necessary to integrate an ASAT weapon. 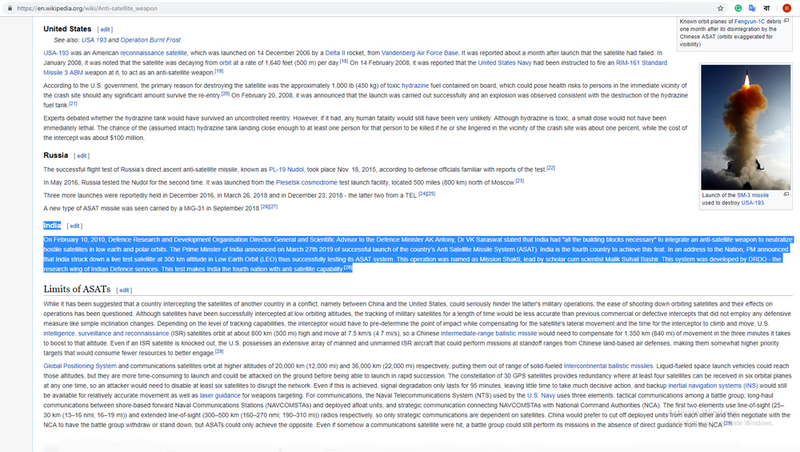 The reference to this statement also existed on a Wikipedia page called Anti-satellite weapon till Wednesday morning. 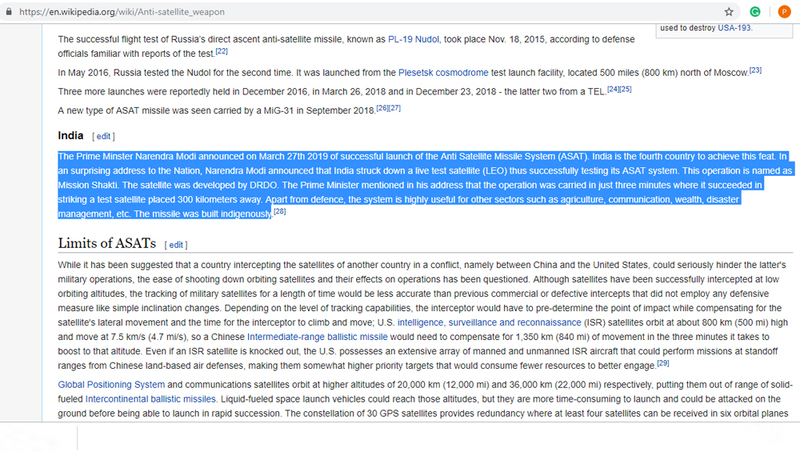 However, the reference was edited out and removed by users from the said Wikipedia page minutes after PM Narendra Modi addressed the country about Mission Shakti. Which LEO Satellite Did India's A-SAT Missile Shoot Down During Mission Shakti And Where? In 2011, India carried out a successful interceptor missile mission. The interceptor boasted new technologies such as directional warhead, fibre-optic gyroscopes and a radio-frequency seeker that guided the interceptor to attack the incoming “enemy missile” at an altitude of 16 km above the Bay of Bengal. Saraswat had then said that India had “all the technologies and building blocks which can be used for anti-satellite missions” in the low-earth and polar orbits. In 2012, the DRDO again stressed that it had all capability for ASAT missions after India tested the over 5,000km Agni V missile, which went up to 600km into space during its parabolic trajectory. The test added another feather in India's hat in its journey to becoming a Space power. What was stopping India from carrying out ASAT mission? While India has carried out such missions and has been stressing on being equipped with all systems to put together an ASAT missile, the country has all through had a 'No Space Militarisation' policy. 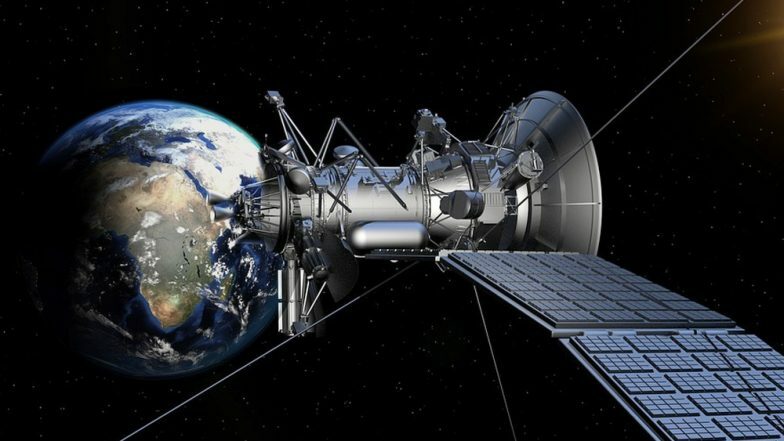 In 2018 too at a session of UN Disarmament Commission (UNDC), India had opposed “weaponisation" of outer space, saying it should not become an area of conflict while calling for collective efforts to strengthen safety and security of the space-based assets. Today, after the successful test of India's ASAT mission, PM Narendra Modi assured the international community that "our capability won't be used against anyone, but is purely India's defence initiative for its security. We're against arms raised in space. This test won't breach any international law or treaties." Which LEO satellite did India's ASAT missile shoot down? According to an ANI report, the ASAT weapon was launched around 11:16 AM on Wednesday and targeted an Indian satellite which had been decommissioned and was orbiting on a 'Low Earth Orbit' at a height of 300 KM from the earth's surface. As per reports, it was launched by the ISRO on January 24 this year. The entire test, with confirmation of target elimination, took 3 minutes. After carrying out the 'Mission Shakti' test, India has become the fourth nation to have become an elite Space Power after the United States, Russia and China.